• Gaming Heatsinks: For maximum cooling and performance. • B360 Chipset: Supports Intel 8th Gen processors. • DDR4 Boost: Optimized traces and isolated memory circuitry. • Turbo M.2: NVMe support, up to 32 Gb/s using PCI-Express Gen3 x4, ready for Intel® Optane™ memory. • PCI-E Steel Armour: Protecting VGA cards against bending and EMI. •Audio Boost: Optimized gaming audio using best components, with Nahimic. Customize and set up your own colour scheme with MSI Mystic Light utility. Select the available colours from the palette to match your system style. Bored of the same colours? Simply change the complete look of your system in 1 second! With multiple colours available, you are the artist to create your own unique gaming rig. Done selecting colours? Choose between several LED effects to really make your system come alive and enjoy your personalized design! • 16.8 Million Colour Customizable. MSI's Mystic Light Extension pinheader provides an intuitive way to control additional RGB strips and other RGB peripherals added to a system, without needing a separate RGB controller. By simply connecting any 12V RGB LED strip to the 4-pin Mystic Light Extension RGB-strip header gamers can sync colours to any style they choose. Create your own colourful masterpiece with ease. The easy to use MYSTIC LIGHT APP is available on PC, phone and tablet. It offers remote control, simply using your smartphone or tablet. Make your PC look and feel brand new with any colour you want with just a few clicks! Designed to support the most popular All-In-One & custom water cooling solutions on the market. A dedicated water pump PIN header supports up to 2 amp, giving you full control of the water pump speed. A clearly marked ‘keep-out-zone’ allows for easy and safe installation and a perfect fit. • Up to 2A supported. • Speed control from BIOS and OS. Outsmart and outperform your opponent’s in-game using an array of unique MSI GAMING tools. Clever hardware & software tools, created to keep you one-step ahead of the competition and boost your skills. Hear your teammates perfectly but still enjoy your audio. Voice Boost automatically reduces the game’s audio when teammates speak, and sets volume back when no one speaks. Easily program your most-used commands and execute them with a single keystroke. You’re free to choose any key you want, so choose wisely. Simply assign functions to any key whether to launch your favourite games, load profiles or do real-time overclocking with the push of a single button. The possibilities are endless! • Launch your favourite game with a single button. • 3x more gold than regular connectors for the best signal. • 10x longer lifetime when plugging/un-plugging. • More responsive, more precise movements. • No keypress left behind with n-key rollover. Gamers and PC Enthusiasts can now enjoy the performance of an SSD on their HDD by coupling it with the new Intel® Optane™ Memory device. Intel® Optane™ technology provides an unparalleled combination of high throughput, low latency, high quality of service, and high endurance. All of the next gen storage connectors support NVMe, the fastest storage standard in the world. Simply put, MSI GAMING motherboards offer the best of the best in storage options & performance. Instantly load your favourite games and always be the first on the battlefield with MSI. Want the best of the best VR experience without any compromise? MSI motherboards offer everything you need when exploring the possibilities of VR. By closely working with the industries’ leading VR vendors, we make sure you get the best possible gaming experience when choosing Virtual Reality. Both hard- and software need to be in tune for a smooth VR experience. One Click to VR makes it very fast and easy to get primed for VR. A single click sets all your key components to their highest performance and makes sure other software applications won’t impact your virtual adventure. Experience smooth gaming with Intel® LAN. Intel® LAN is optimized for championship level online and LAN eSports by reducing CPU overhead and offering exceptionally high TCP and UDP throughput. This means your CPU can be used more effectively, giving you more FPS when gaming. • Automatically prioritizes games above other applications. • Allows you to change applications' traffic priority. • Allows you to customize bandwidth for each application. Enable Intel® Extreme Memory Profile with ease using a single option in the BIOS to gain performance and create a perfectly stable system. Run into trouble? On-board LEDs for key components will indicate the source of the problem so you know exactly where to look to get up and running again. Transfer your favourite games, music and movies over USB faster than ever. MSI offers a wide variety of options to connect and boost your USB 3.1 devices, delivering lightning-fast transfer speeds up to 10Gb/s! Featuring the Intel TURBO USB 3.1 GEN2, MSI motherboards offer never before seen USB speeds with more stability when connecting USB devices. • Get all the performance benefits from USB 3.1 combined with the convenience of the USB Type-C connector. This reversible USB connector allows for effortless connecting of USB devices. This unique and exclusive software allows you to boost the performance of any storage or USB device connected to your system. Simply use X-BOOST’s Easy or Advanced mode to tune your system for up to 20% increased speeds, higher system responsiveness and faster loading of in-game levels. MSI’s Command Center software is the perfect tool to get the most out of your motherboard. With an intuitive interface, Command Center allows you to tune settings to increase system stability, maximize performance and optimize your system’s cooling features. MSI motherboards include RAMDisk, allowing you to create a virtual drive from your system RAM memory. Instantly load your favourite game, speed up your browser or your page file to significantly speed up your system! • Speed up system performance, over 25x faster than a SATA SSD. • Speed up games, apps and browser. With the latest operating systems supporting UEFI fast booting methods, we have added a “Fast Boot” option to take full advantage of this. Simply enable “Fast Boot” either in the BIOS or with the convenient application for faster boot times. Avoid having to mash your DEL/F2 button to get into the BIOS with the Go2BIOS button in the MSI Fast Boot application. Your PC will automatically go to the BIOS on the next reboot for quick. Some models even have an on-board Go2BIOS button. MSI has worked closely with the CPUID team to develop a special edition of CPU-Z featuring the famous MSI GAMING dragon. Use CPU-Z to gather key information of your system’s key components, like CPU speed, Memory speed and timings, motherboard BIOS version and much more. MSI PCI Express Steel Armour slots are armed with more solder points on the motherboard for a stronger hold, preventing any damage due to heavy-weight graphics cards. Steel Armour also protects PCI Express signals against electromagnetic interference for a pure gaming experience and even higher overclocking. We’ve made sure you can enjoy your system endlessly. MSI motherboards feature Double ESD protection with double layer grounding around the motherboard mounting holes, preventing Electrostatic discharge (ESD) surges from damaging the motherboard. 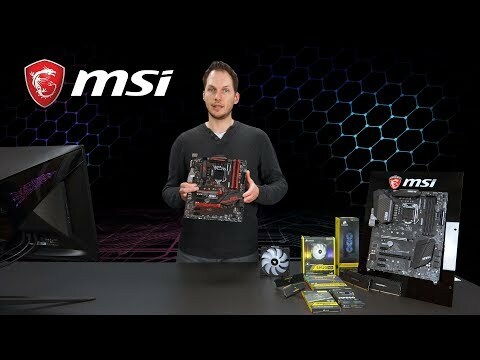 MSI uses components with the latest evolution of the industries’ highest quality standard. MSI quality approved components are shielded with the best protection and make sure your system run smoothly under the most extreme gaming conditions. Each model is tweaked to deliver the best FPS for a stutter-free gaming experience. Tested in 24-hour on- and offline gaming sessions with the most popular gaming gear by the world’s best eSports players, so you can enjoy top performance and reliability in the world’s most popular games. When you just want to get back to your game, EZ-mode presents you with basic BIOS settings and functions for some quick adjustments. If you feel like spending more time fine-tuning options to boost your system’s performance, the Advanced mode is the way to go. Can’t find a specific BIOS setting? Don’t worry, a permanent search option in the top right corner can be used to find what you need. Want quick access to important settings? My Favourites gives easy access to selected Favourite settings, supporting up to 5 groups of Favourites. Updating your motherboard BIOS will not be a nightmare anymore. All the MSI 300 series motherboards are easily for entering Flash BIOS menu, just press CTRL+F5 and one click for updating your motherboard BIOS. When using an SSD, its performance will slowly decrease over time as more and more data is written onto it. This will slow down Read/Write speeds and increase access times of your SSD, making your system feel sluggish. Using an optimized formatting algorithm, Secure Erase+ lets you enjoy your SSD at maximum speed, making your system feel brand new! Features • Supports 8th Gen Intel® Core™, Pentium® Gold and Celeron® Processors for Socket LGA 1151. • Supports DDR4 Memory up to 2666 MHz. • MYSTIC LIGHT and Sync: Personalize your PC with 16.8 million colours / 10 effects controlled in one click with the Mystic Light APP or a mobile device. • Lightning Fast Game Experience: TURBO M.2, Intel Optane Memory Ready. Intel Turbo USB 3.1 GEN2. • AUDIO BOOST with NAHIMIC: Reward your ears with studio grade sound quality for the most immersive gaming experience. • DDR4 Boost: Advanced technology to deliver pure data signals for the best gaming performance and stability. • GAMING LAN, Powered by Intel®: The best online gaming experience with lowest latency and bandwidth management. • Multi-GPU: With STEEL ARMOR PCI-E slots. Supports 2-Way AMD Crossfire™. • VR Ready: Best virtual reality game experience without latency, reduces motion sickness. • In-Game Weapons: GAMING Hotkey, X-Boost, Voice Boost. Does this mobo only support 1 HDD / SSD? I only see one SATA connector bottom right. No it has 3 ports but i wouldn't recommend it,bought it myself and no end of issues with it (software malfunction) look to Asus or other brands and make sure to do more research than i did!